Just Cooking N Baking ....: Spicy Bread ..
* In a Microwave safe bowl Microwave water and milk together for 45 seconds until it is luke warm to touch( Double check this,because if it is too hot yeast will die ). And then pour this into a wide bottomed bowl. * Dissolve in the sugar and yeast in it and mix thoroughly until dissolved. Leave this aside to set for 20 mins until the yeast mixture becomes frothy in texture. (This is the important step in proceeding further to the bread recipe.If the texture is not frothy, bread does not proof so throw it and start the process again from the scratch). * Meanwhile heat vegetable oil in a non-stick pan and crackle cumin seeds in a low flame and then add chopped onion and fry until it turns into transperent. Now add salt,coarsely ground chilli paste,chopped cilantro,chopped dill leaves and mix well and saute it for a minute in a medium flame. Switch off the flame & keep it aside until the mixture is cooled. * Now put some flour on the working surface or rolling board or a well cleaned kitchen platform and take the lump in hands and start knead the bread towards you. * Follow the same method and knead it properly for 10 mins roughly until you get a non-sticky but still smooth dough.Add flour in between when the dough is sticky. 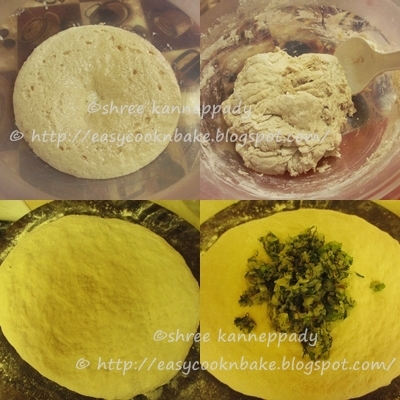 * Gently roll the dough using rolling pin with to flatten it and keep the bread masala mixture in the centre and fold it from all the sides like how we do for stuffed paratha or for hoLige. * Slowly start kneading again for 6 to 8 mins until the mixture is very well incorporated in the dough.while kneading the dough might become sticky because of the onions,so please feel free to add the flour when required. * Cover this rolling board with some kitchen towel as we need to use this place again for kneading. * Preheat the microwave for 45 seconds. * Now grease your hands and a empty big air tight container with vegetable oil and slightly coat the dough with oil. and place it in the greased container. Close the lid and keep it in a microwave for 1 hour 45 mins to 2 hour or until dough rises double in size. * Now again knead the dough gently for 7-8 mins,this process is important as it assures of removing air bubbles formed in the bread dough.Repeat the same process with buns portion as well. 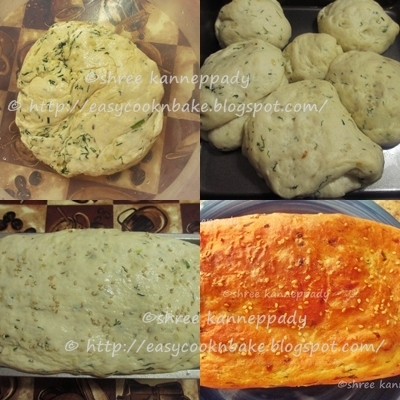 * Grease the loaf pan and baking dish(to bake buns) and then place the dough accordingly. * Keep the loaf and baking dish again in a warm place for 1 hour for the final rise. * Mean while preheat the oven at 400 F for 10 mins when you are about to finish the rising time of bread. * Brush the top of bread loaf and buns with milk ( Brush it very gently (Treat bread and buns as a flower in this step)) and sprinkle sesame seeds over the nicely risen loaf and buns and keep it in preheated oven and bake them at 400 F for 18 to 20 mins( It depends on the oven) until the top portion of the bread turn slightly golden and the bread should sound hollow when tapped the crust with hand. * But for buns you can bake it only for 11 to 13 minutes. Because buns bake fast as compared to bread. * Run the knife around the edges and slowly remove the bread from the loaf and also remove buns from the baking dish and let it cool on the wire rack for 1 hour. *After 1 hour cut bread into the slices of desired thickness. Your spicy bread looks Perfect, Very nice crumb. Vangi Bhath / Eggplant Rice ..
Dill & Lentil Soup / Dill-Lentil Rasam ..
Fenugreek leaves Palav / Methi Pulao ..
Misal Pav for SNC Challenge ..
Spicy Pongal / Khara Pongal ..